This past January two of my good friends got married. They rented a gorgeous facility, planned a fun day for everyone, and braved the cold when it came time for taking photos. Kate and I were both honored to be in the wedding party. One month after their engagement we enjoyed a beautiful fall evening with them, sitting in a circle on the patio as we discussed their upcoming wedding. And they had a request. They wanted us to come up with a creative idea for their guest sign in. And not just creative—they wanted something that hadn’t been done before. There was to be no looking on Pinterest for the latest trend. A challenge! I liked it. But as much as I liked it, I was also going to be realistic. Whatever we came up with, even if we handn’t seen the idea elsewhere, would probably have been done before. Nothing new under the sun, right? But we did stick to the guidelines and didn’t probe the internet for ideas. It was more difficult than expected. We ran through a number of scenarios, but in the end there’s very little time for the process. People arrive a few minutes before the ceremony starts—there’s time for no more than a signature. They had trees as part of their theme and we focused on that. My father came into play once again as he works on trees. I remembered he had a very nice cross section of a tree trunk in his shop that he offered me in the past, and he readily agreed to let me have it for this project. The pieces he saves, he saves because they’re unique. And this one was unique because the center core of the tree was way off to one side, close to the edge of the section. The rings on one side were packed tightly together while on the opposing side they spread out widely. Plus it had never cracked. That’s rarely the case with pieces like this. The cross section had a very unique shape with the centermost rings positioned at the very top. After finding this perfect piece, the process was straighforward. I sanded down both sides. Then just north of the mid point I used a wood burner to etch in their names (or in this case, a combination of their names) and the wedding date. We bought a few Sharpies which people would use to sign the wood and we were done. This would be their guest registry—simple yet elegant. And substantial too—this was a thick piece and quite heavy. It’s back in my hands at the moment as I’m going to lacquer it and attach hardware to the back so it can be hung on their wall. 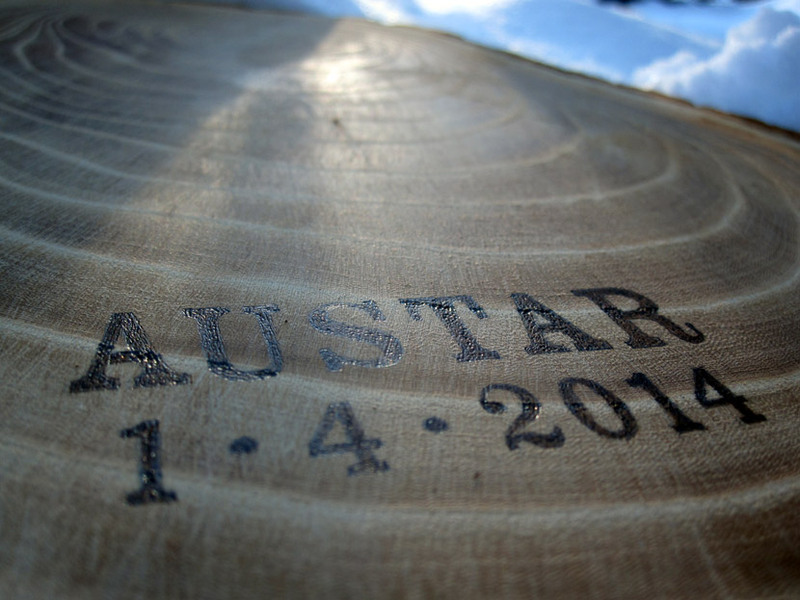 A combination of the couple’s names was burned onto the piece of wood along with the date of the wedding. The sign in process happened very smoothly. I handed each person a Sharpie, asked them to simply sign their name, and requested they leave room around the couple’s title. 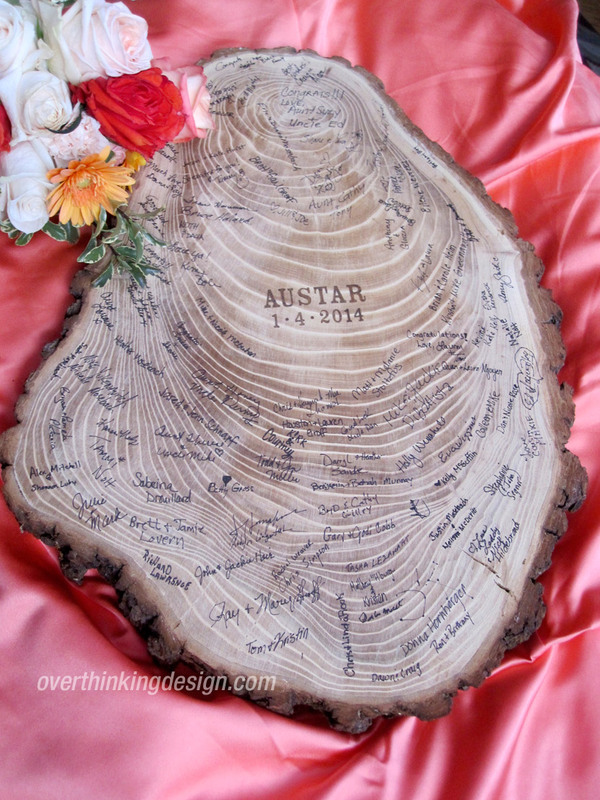 That last point allowed the wood burned names to stand out amid this couple’s vast “family tree” of friends and supporters. This is the finished piece, with guest signatures covering the piece of wood. Hello! I love this idea! 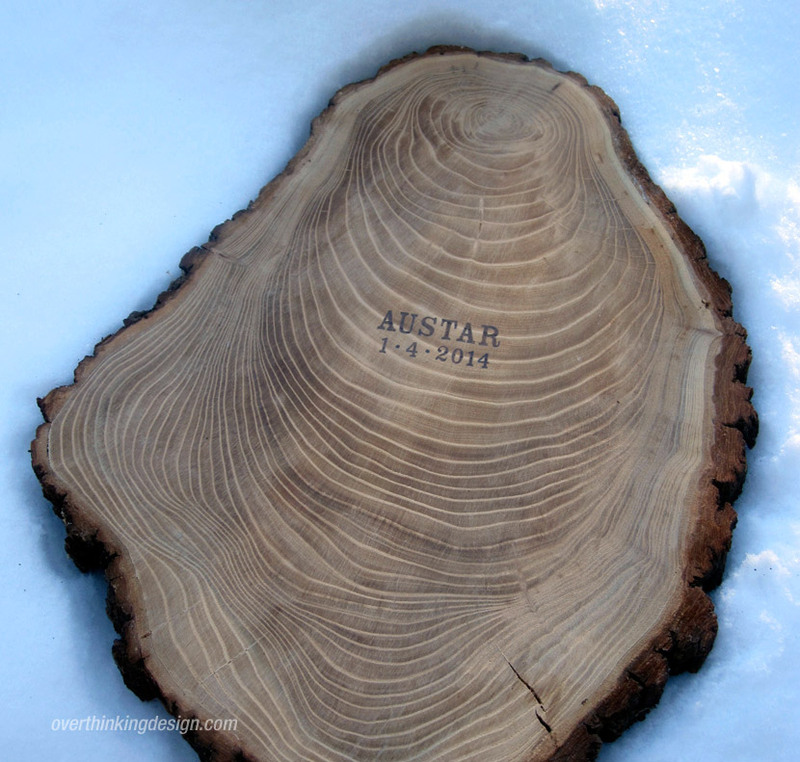 I have been thinking of dping this for my wedding in June with a piece of a tree from my childhood home. The only thing I have been told is that the trunk may need to sit for a very long time to dry out. Is this something you or anyone else would be able to help me out with? I’m not sure how long it would take and we only have till the end of june! Is this long enough? Hi Nicole. Congratulations! Is the piece of wood already cut? If so, you have a decent amount of time for the wood to dry out, though it won’t be totally dry unless it’s very thin. However, I see no reason why you can’t proceed with that piece of wood, regardless. Just be aware that it’s likely to crack as part of the drying process. There are ways to help prevent cracking, and you can use a kiln to help it dry faster, but those processes are beyond my scope of expertise. Thanks for the comment! Send a photo in June!